Many types of flowers grow at the foot of Mount Kaimon, the southernmost mountain of mainland Japan. Among these are numerous yellow tokkobana, kamikaze flowers. This fictional story gives the history of these flowers at the foot of Mount Kaimon. Children from kindergarten to early elementary school will most appreciate this story told from the perspective of an eight-year-old girl. The book also has many cute illustrations of scenes in the story. Three young kamikaze pilots visit a small inn for one night in a village just south of Chiran Air Base, the Army's main sortie base for kamikaze attacks on Allied ships around Okinawa. A mother and her eight-year-old daughter, Chii-chan, take care of the inn alone, since Chii-chan's father departed some time ago for the battlefront. Even though the inn has an ideal location with a beautiful view of Mount Kaimon, the inn has not received any visitors for some time because of the war. The three pilots enjoy a delicious dinner served by the mother and her daughter. After their dinner, the mother goes to visit neighboring farms to try to obtain food for the next day's breakfast. The young men see the very small amount of food that Chii-chan has to eat after their filling dinner, and they then realize how much they ate. While Chii-chan's mother is away from the inn, the three young men kindly play with the little girl by doing magic tricks with cards, playing cat's cradle, and singing songs together. During the evening, Chii-chan grows attached to the pilots as if they were her older brothers. The next morning the young men, dressed in their pilot uniforms, get ready to leave the inn to return to base to make their attacks that day. Chii-chan and her mother go quickly to pick flowers to give them to the departing pilots. The three young men leave their breakfasts uneaten, with the excuse that they are still full from last night, but in fact remembering how little the mother and daughter have to eat. As the pilots proceed in their planes toward Okinawa, they each throw out their flowers on the slopes of Mount Kaimon, the last point of mainland Japan on their way from Chiran to Okinawa. Today these flowers and the many others thrown down by kamikaze pilots who traveled the same route over Mount Kaimon have turned into a beautiful field of flowers. The title, A moon twenty-six days old, refers to the custom of villagers living near Mount Kaimon to have a procession there each June 26 in the evening. There is the belief that within the light of the moon that night can be seen the figure of the Buddhist Kannon (Goddess of Mercy). The people go single file with lanterns on the path to the foot of Mount Kaimon, where they pray together in the light of the moon. The author writes, "Each single flower blooming at the foot of Mount Kaimon contains the spirit of a soldier who will never return" (p. 35). This children's book tells the same basic story as a 1998 television movie with the same title and also written by Tetsuya Takeda. However, this book tells the story from the perspective of the little girl Chii-chan, whereas the movie presents the story of the three pilots in a flashback with a more complex plot. 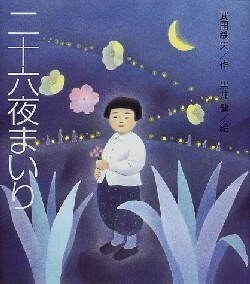 The little girl in the movie gives the three pilots yellow tokkobana (kamikaze flowers), whereas Chii-chan in the book picks three different types of flowers: dandelions, violets, and pink primroses. The mother in the book also gives them wild cherry blossoms. In contrast to the book's focus on the relationship between Chii-chan and the three pilots, the mother in the movie develops a special relationship with one of the pilots, and she asks him several times to please come back from battle. Takeda skillfully relates a sensitive story that teaches young children the importance of love and caring even during times of fighting. The author also presents an extremely idealistic image of kamikaze pilots, kind and polite to others and courageous in the face of death.